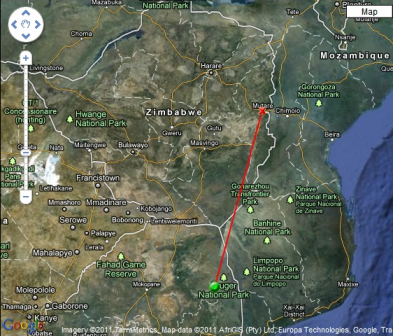 This week details of a Red-billed Quelea recovered in Zimbabwe, near Mutare (ring FH14281), were received. The bird was found injured on 13 August 2011, and it died later. This bird had been ringed on 11 April 2004 as an adult female by Herman and Zephne Bernitz at Klaserie Private Nature Reserve. The direct distance between ringing and finding sites was 593 km. The elapsed time was 7 years 4 months 2 days. This is greater than the previous record of 7y 1m 12d (ring 60174461), although Craig 1982 (Mortality rates of some South African Ploceidae. Ostrich 53: 54-57) lists 10y 0m - this record, however, has not been traced in the SAFRING database.